Seventy per cent. More or less. 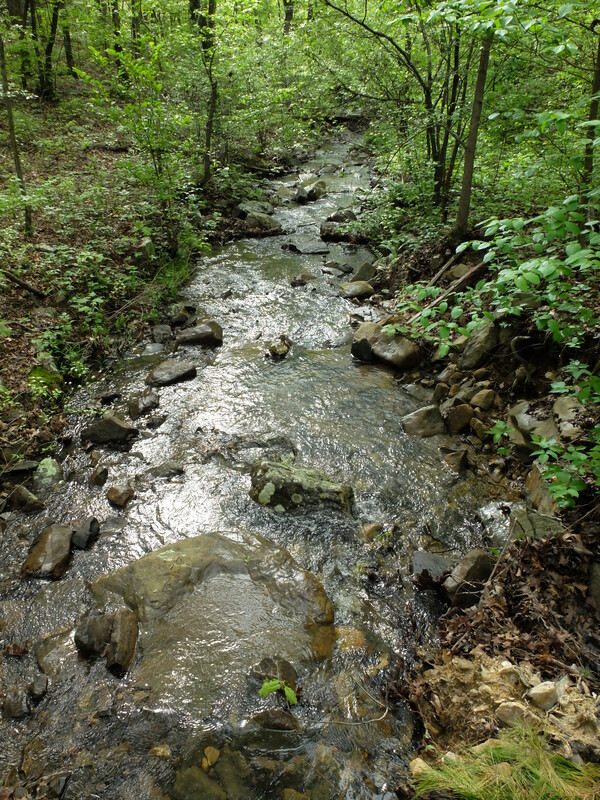 We have now completed seven of 10 sections of the Ouachita Trail (OT) and have the end in sight. My good friend Mary McDaniel and I are section hiking the 223-mile national recreation trail, an effort we began in April of 2011. It’s hard to believe we’ve been at it for four years. 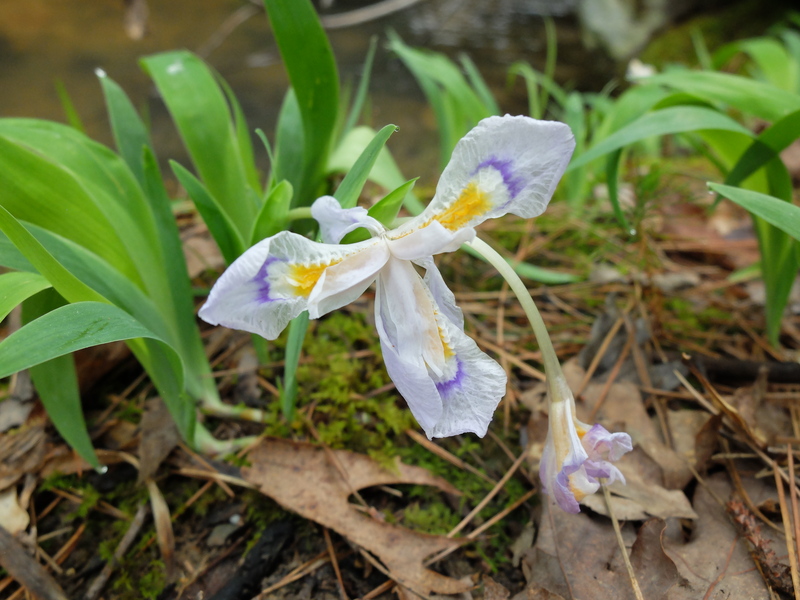 We hike spring and fall – the “shoulder seasons” but truly the prime time for hiking in the South Central United States. 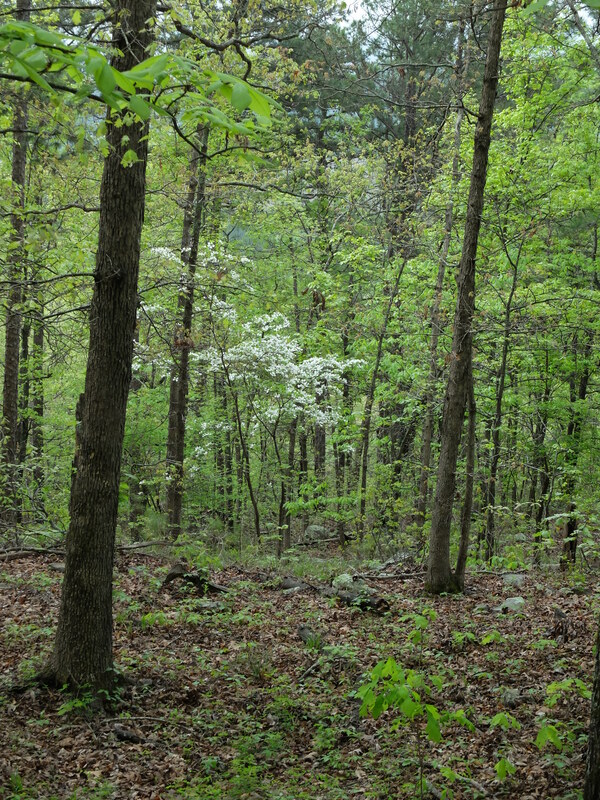 Summer hiking is something we generally avoid because of the undergrowth – including a great deal of poison ivy – and the insects, especially those nasty ticks. We have completed a section of the OT each spring and fall since we began, except for those years when we had other priorities – the Eagle Rock Loop one year, and my trip to Nepal trekking to Mount Everest Base Camp another. Last weekend (April 17 and 18, 2015) we hiked the 21.6 miles of Section 7, with hiking buddies Deb Cox and Pam Frank, who have hiked several other sections with us. 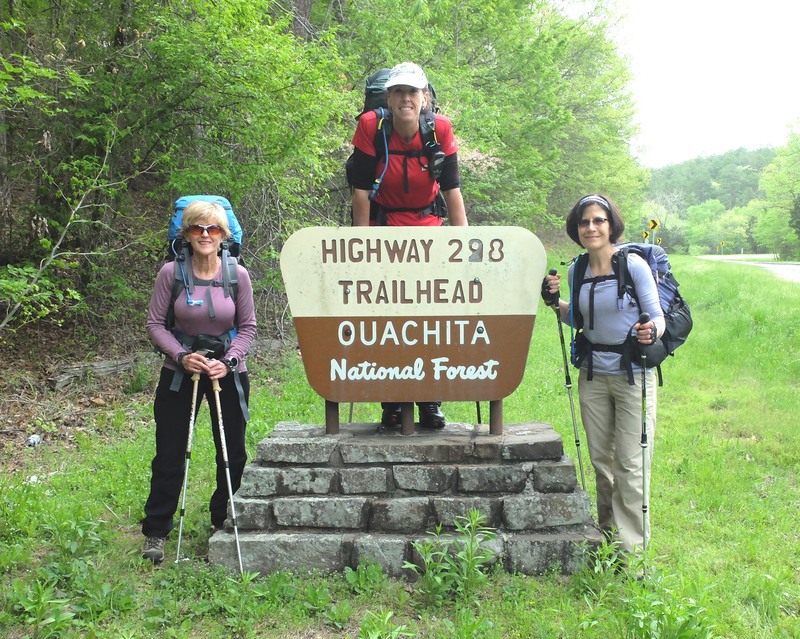 This time we used the current edition (#5) of Tim Ernst’s Ouachita Trail Guide. 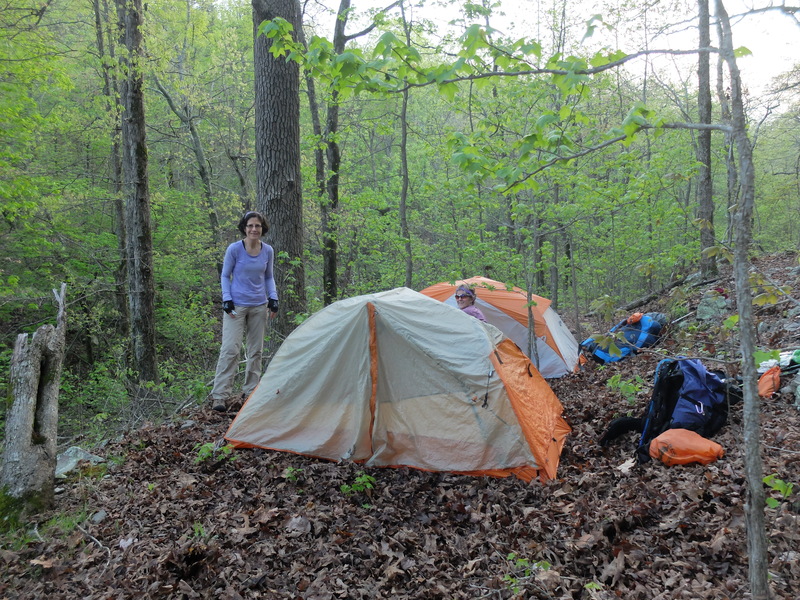 When we hiked Section 4 in the fall of 2014, a re-route had occurred and we experienced difficulties created by failing to have the latest trail guide. In other words, we went around in circles. 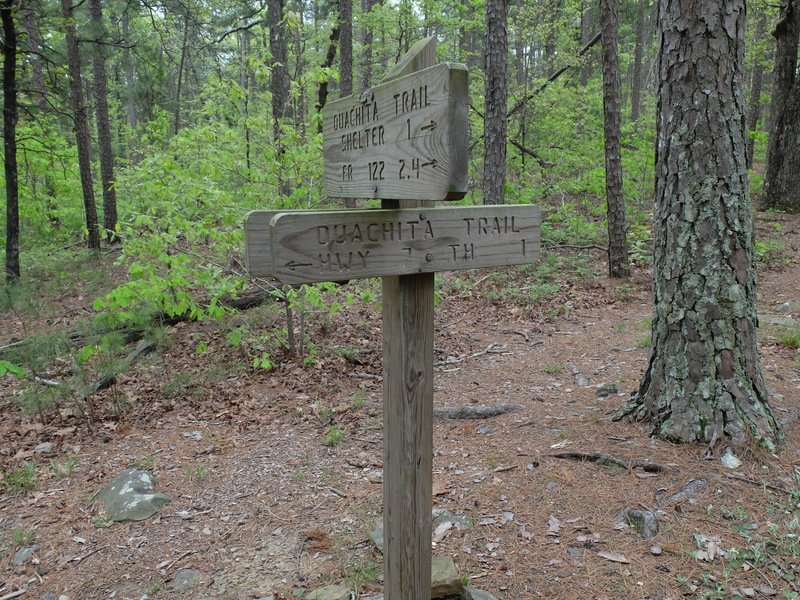 Section 7 was well marked and well maintained, thanks to the Friends of the Ouachita Trail, and we had no problem staying on track. 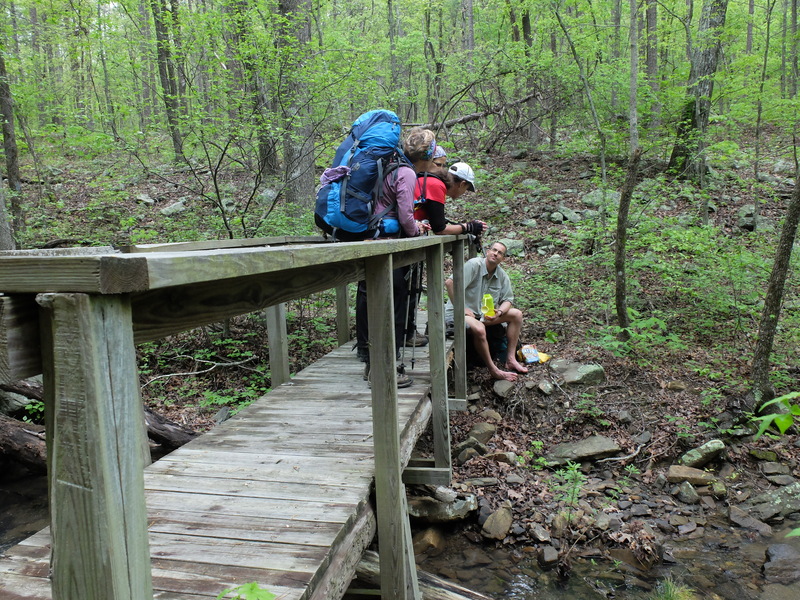 We began at a trailhead on Highway 298, 11 miles east of Story, Arkansas. 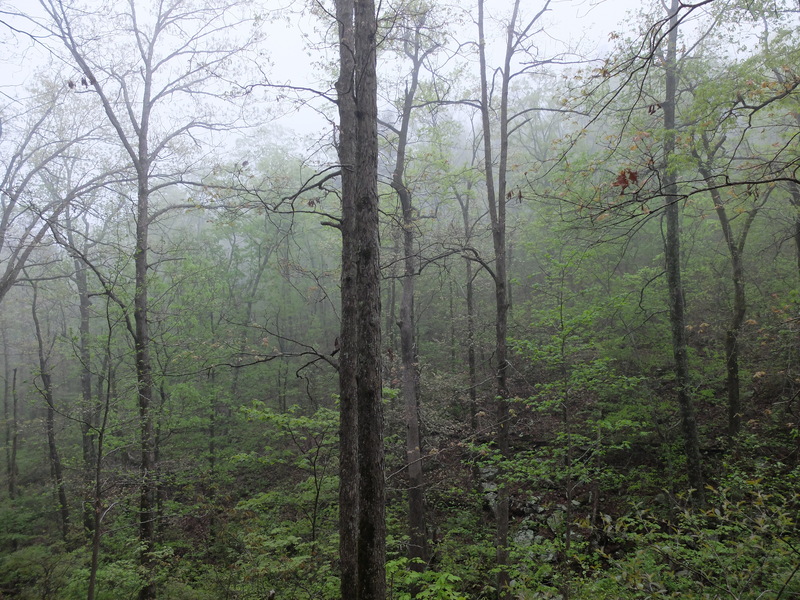 Rain had been forecast for the weekend but by 2 p.m. on Friday, April 17, it had not begun and it appeared we would have dry weather for hiking that day. 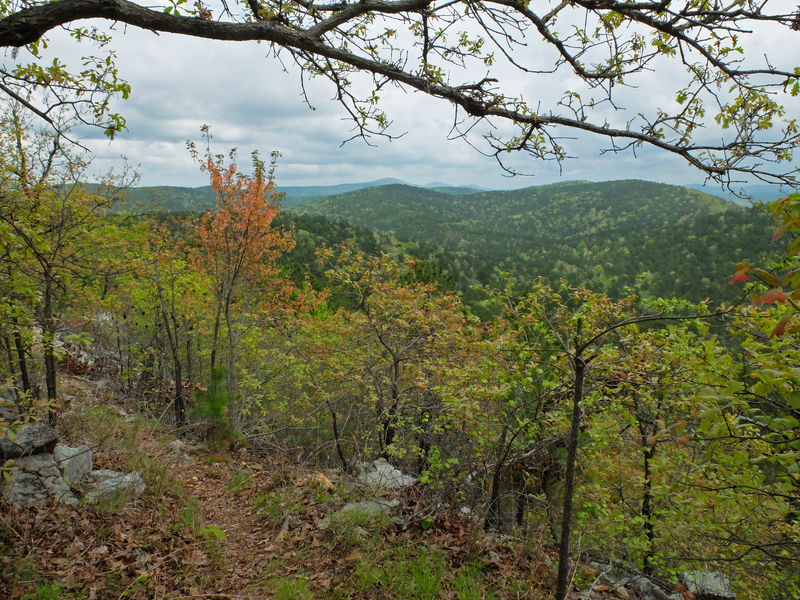 In the first eight miles we gained over 1,000 feet of elevation as we ascended to Ouachita Pinnacle, at 1,961 feet the highest point on the trail since Fourche Mountain, and the highest point for the remainder of the trail. All downhill from there? Not exactly. Over the next two days we would experience nearly 4,200 feet of total elevation gain. LOTS of ups and downs! And warm, humid weather, making the climbing a bit more of an effort. 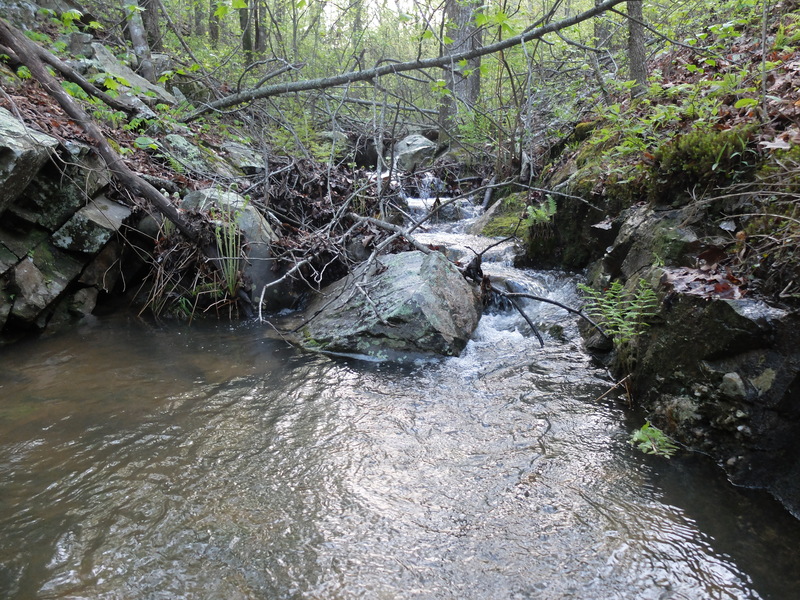 On Friday, we hiked nearly 10 miles and camped at Blocker Creek, a beautiful stream near the trail. The creek banks were steep but we found a nearly flat spot – apparently created by a road grader at some point — where we set up all four tents for the night. That day near Blue Mountain Shelter we had met another hiker – the first we had come across in all of our hiking on the OT. He said he was hiking from Highway 7 to Highway 27 (east to west) and that he was “Wayne from West Virginia” but his trail name was “Teriyaki.” I made sure we got a photo with him since at the time it seemed like a singular event. 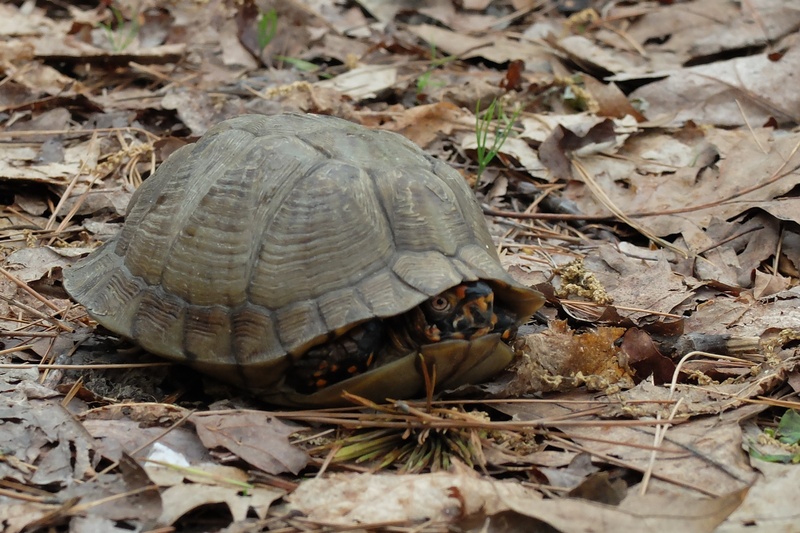 He seemed a little skittish about being photographed. The next morning we got on the trail around 8 a.m., unsure whether we would try to finish the trail that day or camp at Moonshine Shelter, about 10 miles from our starting point. Again we had mostly dry weather and it was one of the most beautiful sections of trail we have seen, with dogwoods blooming in the forest, clear streams running down from the mountain, and trees leafing out in that lovely spring green, colors made more lush by the morning fog and overcast skies. 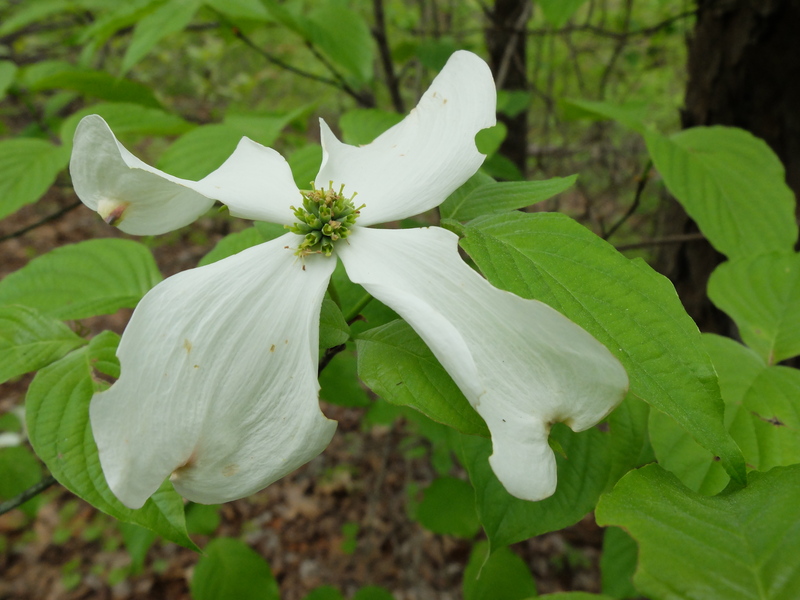 Along with the beauty of springtime, we experienced an abundance of knee-high poison ivy and a few ticks. It is already nearly too late in the year to be out on the trail. As we approached Big Bear Shelter we were surprised to spy another hiker sitting on a bridge, and we stopped to talk with him. He was from Boston, through-hiking the trail east to west. He said he was having some trouble with his feet because of all the wet weather and not being able to get his feet dried out. We didn’t get his name but later saw a post from another through-hiker who mentioned meeting Jay from Boston on the trail a few days before we met up with him. Must be the same fellow. We ended up finishing the trail, about another 12 miles, by 4:15 that day, the last mile hiking in the downpour we had escaped the first 20 or so miles. Knowing we were so close to the end made getting drenched something of a pleasure, although I was anxious to get into dry clothes shortly after! The terminus of this section is a few miles north of Jessieville on Highway 7. Now, just three more sections . 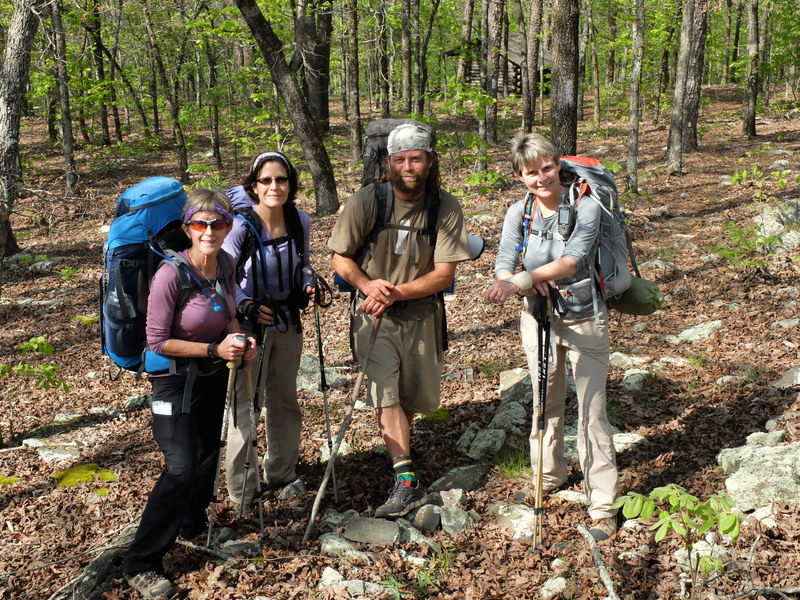 . . but they will have to wait for 2016 because we are planning to hike the first half of the Ozark Highlands Trail in the fall of 2015! Another great adventure! Your photos are beautiful.